These darkroom red safelights are comprised of a cluster of 20 light-emitting diodes (LEDs) in the film-safe spectrum; red lights generally work well with papers which have an amber light 'prescribed'. The LED lamps are supplied in a small bulb housing and are available with the modern and safer GU10 base as well as the traditional, large Edison screw fitting, E27. These bulbs consume very little power - less than 2W - but produce light similar to a 20W incandescent bulb. Output is bright but precise at 630nm wavelength, which is ideal for TEM films, red-safe autoradiography emulsions, X-ray films and other light sensitive emulsions. Cluster of 20 light emitting diodes in the film-safe red spectrum. Produces better quality images - no fogging from worn or damaged filters. Improved working conditions in darkroom. Fraction of the cost of alternative LED lamps and traditional darkroom illuminators, which consisted of housing, bulbs and filters. We recommend the use of two fittings or a twin fitting with rotation and angle adjustments. It is best to bounce the light off a white wall or paper to avoid 'hot spots' and to achieve uniform lighting. Instant full brightness, frequent switching does not affect lamp's life. The word "safe" is a relative term. Most sensitised materials will become 'fogged' if exposed to a 'safe' light for an excessive period of time. Always minimise the exposure of photographic materials to safelight illumination but aim for a brightness that makes darkroom work easy and effective. Testing a safelight: With the safelight on, lay a piece of film (emulsion up) on the workbench. Cover half of the sheet with an opaque object. Leave to expose to safelight for double the usual time required for processing the film. Then develop, fix, rinse film and check if there is any density difference between the covered and uncovered part of the negative - if there is, then the distance of the light must be increased. Most EM sheet films may be processed using this 4 litre developing tank and the appropriate rack. Complete with floating lid to minimise oxidisation and evaporation of developers. Inside dimensions: 203mm x 101mm. Stainless steel processing hanger for sheet films. 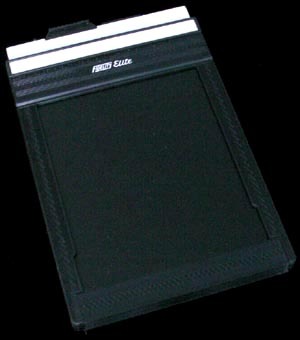 CUT FILM HOLDER, 4 x 5"
Handles all 4 x 5" sheet films. 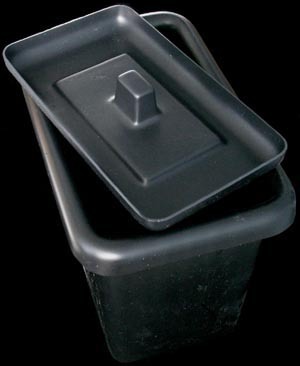 Sturdy plastic and black anodised metal construction with locks and write-on strips. Built-in wheels for film marking. Moisture-proof, interlocking and lightweight.